This outfit was a copycat of one of Natalie Suarez's outfits from back in the day, hence my weird face...trying to match her cool 'I don't care look' and failing. And look how long my hair was...a little TOO long if you ask me, and that's saying something because I'm not a fan of shorter hair on myself. Sadly I don't have the jeans anymore but every other piece in this outfit was still in my closet! I think the times where my Dad can take photos during the week are at an end. I got to my parents house at 4:50 and we needed the flash...NOOOO! But at least on the weekends he can still take them for me. Otherwise it's back to the tripod during the week. This is a pretty great homage - I think you totally nailed the oversized sweater. How cool that most pieces are still around… I've gotten rid of so much stuff that its hard for me to pull off these throwbacks. I love the scarf - I dont think i had seen you wear it before. Oh I love that cosy scarf and how you've worn it! I love revisiting outfits - you just go to show here that old adage that style really is eternal! cozy!! 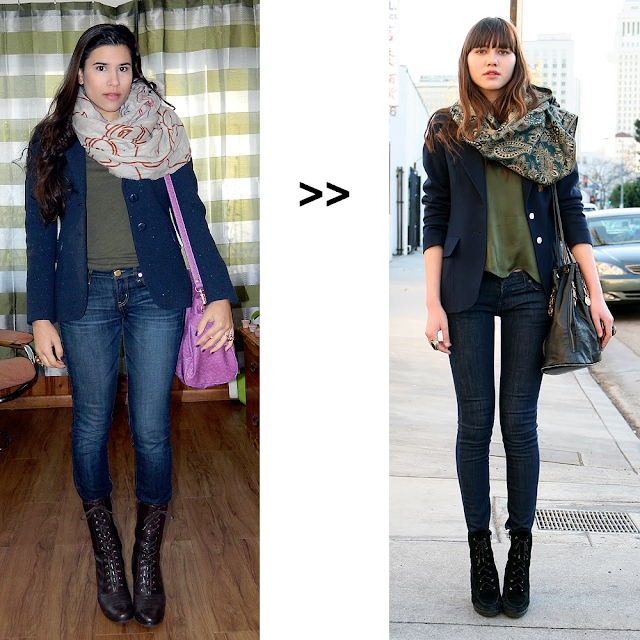 Love the scarf and bag! Perfect execution on both accounts.